Below you'll find Sketch 294. Create cards, scrapbook layouts, home decor, treat containers, mixed media, etc. using this week's sketch and be sure to link your project below for a chance at the weekly My Favorite Things Gift Voucher worth up to $20. 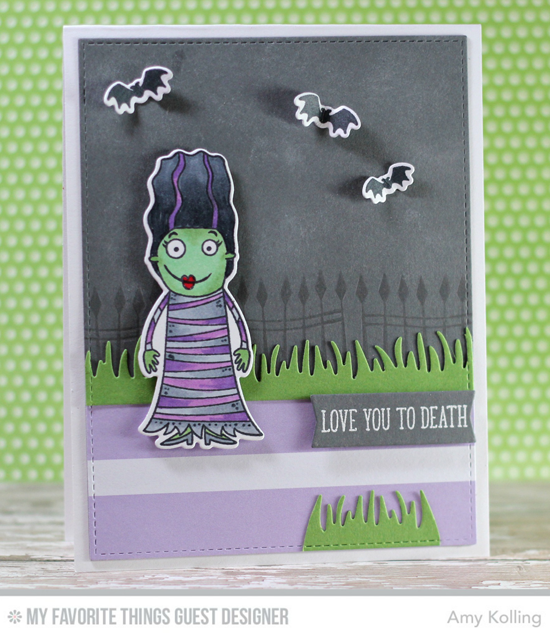 Amy's take on the sketch is frightful fun with the Frightful Friends stamp set and Die-namics! In place of the vertical rectangle, she features one gorgeously spooky Bride of Frankenstein set against a mysterious dark sky and sinister fence. But somehow the lavender and green make this card as cute as can be! I love the little tuft of grass at the bottom to balance out the design. The My Favorite Things Creative Team has been busy getting creative! Let's see what they have up their sleeves for Sketch 294! 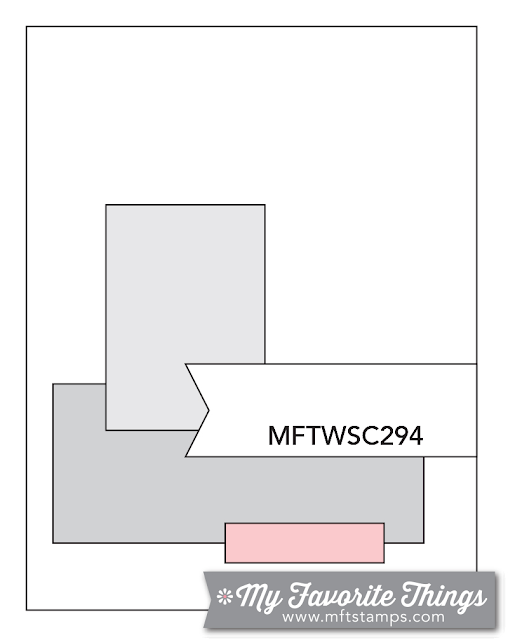 Sketch 294 affords a lot of options as you'll see from the examples our design team has created. 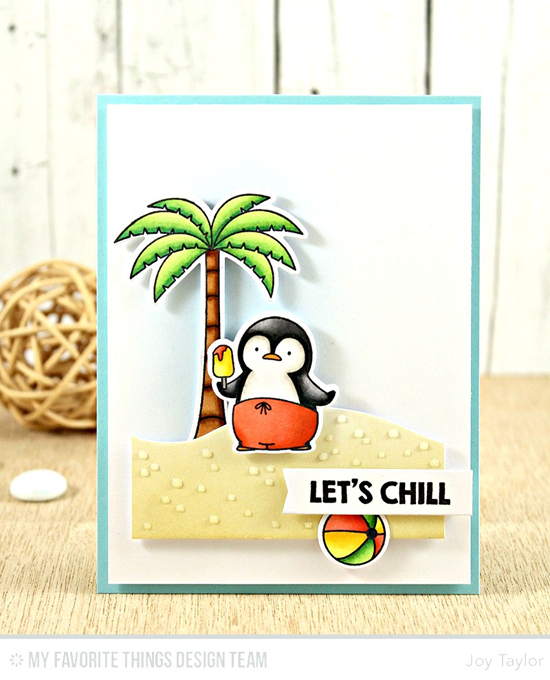 Joy places a palm tree where the vertical rectangle of the sketch appears and a sandy hill to ground it and the cool dude from the Penguins in Paradise stamp set. The banner is the perfect spot for a sentiment, of course! 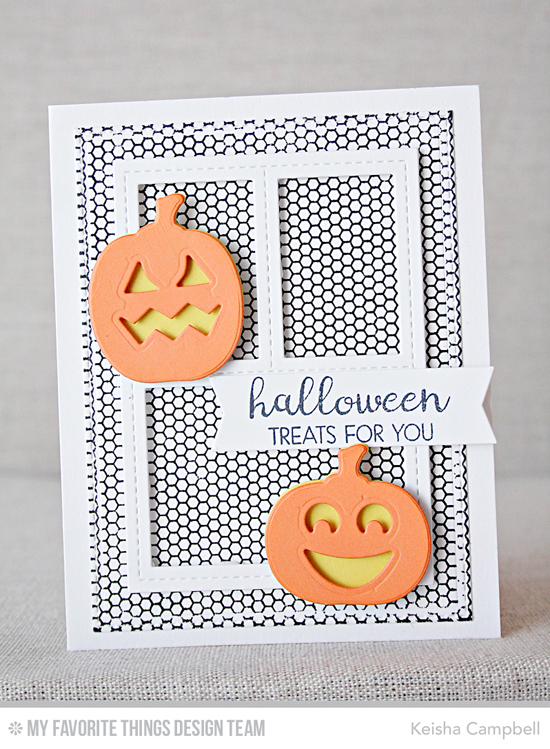 Keisha mimics the rectangular shapes of the sketch with a frame die from Blueprints 29, and places too-cute-to-spook pumpkins from the Spooky Sweets Die-namics in a similar orientation to the sketch. The neutral background allows the jack-o'-lanterns to POP! Amy envisioned a cityscape in place of the horizontal rectangle and adds a fire-breathing cutie pie from the Magical Dragons stamp set to give weight to the left side of her design. I love how pretty the lavender flagged sentiment looks adding balance to her design. Anna's Christmas card inspiration continues with this uncomplicated design based loosely on Sketch 294. 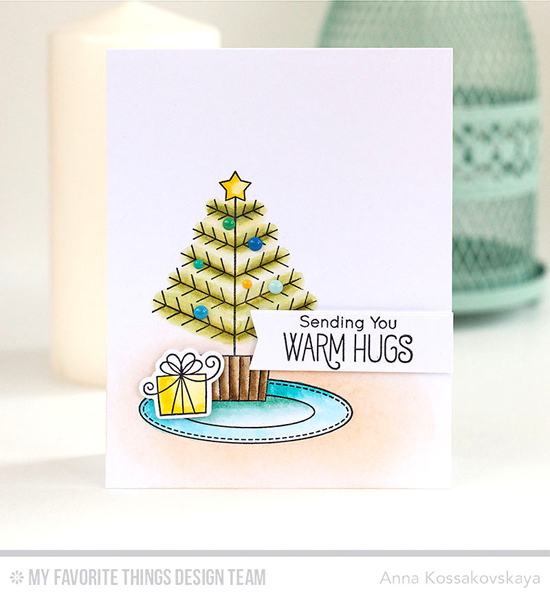 A sweet Christmas tree creates height on the left side of her card like the sketch, and her sentiment completes this simple, yet lovely design. Barbara's take on this week's sketch is quite literal, and the result is fantastic fun! 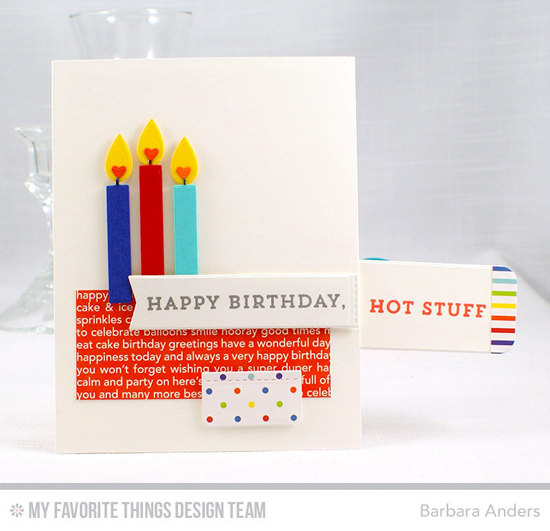 She adds more whimsy to the design with the Slider Channel Builder Die-namics, creating an interactive pull tab with an additional sentiment from the Make a Wish stamp set. Keeway came up with a clever combination of stamps pairing the Cheeky Monkey and Get Down to Business stamp sets! I love the fresh color combination on this sweet masculine card. Congratulations, dvb_designs! You are the randomly selected winner of last week’s sketch challenge. You can view all the entries for last week’s challenge HERE. You have until Tuesday, August 23rd, at noon EDT to add your link and be eligible for the prize of up to $20 in MFT Cash to be spent in the MFT boutique. Winners are chosen at random, so everyone has a chance! The weekly prize is a $15 Gift Voucher to My Favorite Things, but if you use MFT stamps and/or dies in your project, you’ll receive an extra $5. Thank you so much! Can't wait to create with this sketch!